From Coin Jewellery To Quirky Bow Ties, The Accessories From This Chennai Label Are Simply Lit! Recherché, a Chennai-based online label offers quirky accessories both men and women that too at budget prices. Chennaites! We found a new destination for your accessories shopping and it’s F-A-B-U-L-O-U-S! Started by Chennai-based Namrata Khandelwal and Karishma Jain, Recherché, is an online accessories label has trinkets and baubles for everyone. Starting from just INR 100, you can find everything from studs and long duster earrings to bow ties and brooches here. The chaandbalis and meenakari jewellery totally won our heart with their pretty designs and budget pricing. We also loved the statement jewellery here that comes in varieties like duster earrings, tassels, matte-finish studs with contemporary designs that can go perfectly with your party wear. Recherché also has a lot of temple and oxidized jewellery. The oxidized jhumkaas with coin detailing are our favourite. We also liked the wedding collection here that comes with bejeweled with kundan, pearls, and stones. Ladies! You can also add a contemporary to your western outfits with the oxidized necklaces, long chains, and chokers that start from about INR 300. Guys, you can totally go crazy with their cuff links and wooden brooches that are quirky, casual and can add some fun to your dressing game. Their bow-ties that come with mustaches in cool geometric patterns are also quite rad! You can also pick out cool brooches for your henchmen and bridesmaids at Recherché. 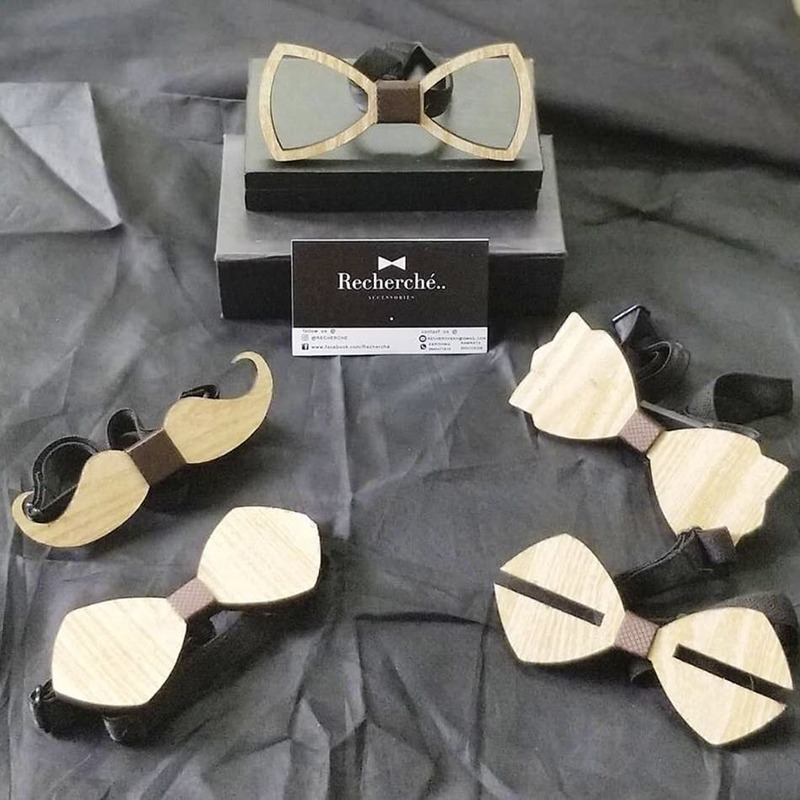 Available in wooden, metallic and acrylic varieties, the minimum order requirement for these is 10 pieces and usually come mustache embellishments, pearls, and stones.